This book is very much a seminal work on the history of Heversham and the surrounding area. Subsequent publications on Heversham often draw heavily from this source. The ancient manor of Heversham was subdivided, about the year 1090, by the grant of the church and one-third of the lands to the newly founded Abbey of St. Mary at York. Some two-thirds remained with the Barony of Kendale until it was given, about the year 1160, by William de Lancaster as a marriage portion with his daughter Agnes, to Alexander de Wyndesore. The former moiety became known as the Rectory Manor and the caput or chief house was Heversham Hall; while that of the latter was the Court or Manor House in Milnthorpe - the village built up beside the ancient mill. The Rectory manor and demesne of Heversham Hall remained with the Abbey until the Dissolution when the Crown sold it, in 1558, to Edmund Moyses, Richard Buskill and Richard Foster. Buskill soon bought out his partners and on 8 August, 1582, settled the manor upon the issue of his son Thomas's marriage with Frances a daughter of Jasper Cholmley. Thomas died in the lifetime of his father, at whose, the father's death in 1602, Jasper son of the said Thomas then a lad of fifteen years was found to be the heir of his grandfather Richard. In 1613 Jasper Buskill conveyed this Rectory manor with Heversham Hall to Edward Wilson of Nether Levens, in whose posterity it has descended with the Dallam Tower estates. The Wyndesore manor descended through five generations to a coheiress, Marjoire, who married John Ducket. Her trustees sold it in 1398 to Ralph, earl of Westmorland, who granted it to his third son George Nevil, His descendant John Nevil, lord Latimer, died in 1577 without male issue but he left four daughters, This Heversham estate fell to the pourparty of Dorothy who married Thomas Cecil, 1st Earl of Exeter, and in 1583 they conveyed the manor to Thomas Bradley of Arnside. 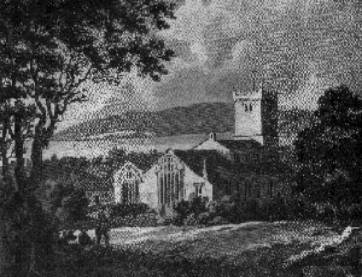 In 1597, William Bradley conveyed it to James Bellingham of Over Levens, since whose time it has descended like the manor of Levens.